Our day starts with a short drive to Mt Lofty where we indulge ourselves in panoramic city views. 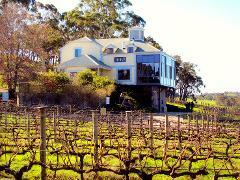 The Adelaide Hills beckon as we hasten to Hahndorf for a sumptuous morning tea/coffee and cake. Two cellar doors, including Hahndorf Hill Winery –' Choco-Vino' Chocolate & wine pairing experience, before our fabulous two course lunch at ‘The Lane’ winery. We have ample time to meander through historic Hahndorf village.